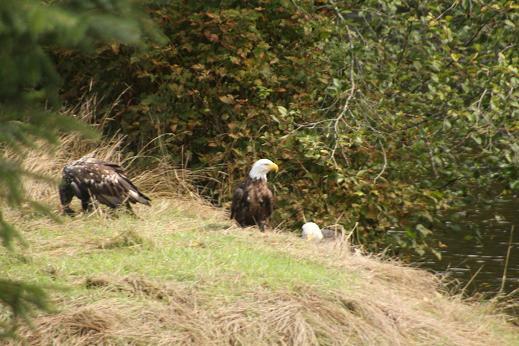 Two adult bald eagles and one juvenile eagle make up a family unit. Once the salmon are in the river the eagles come for the easy “pickens”. Like all “wildlife” a free meal is a free meal and the less energy one has to expend the more fat one accumulates. The viewing stands we use on Knight Inlet’s Glendale River provide excellent opportunities for photos. The March 25th and 26th postings are from this location as is today’s photo. This grizzly bear is less than 15 meters (yards) from the camera lens as it makes a meal of the salmon it just caught below our viewing platform. 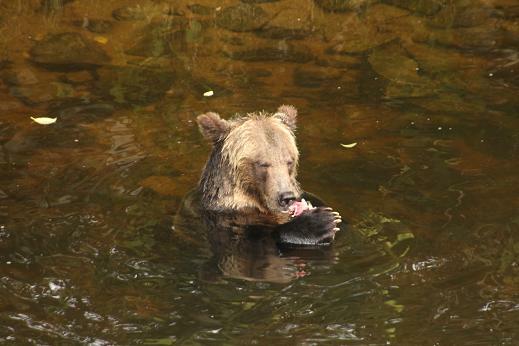 This grizzly is sitting on the bottom and enjoying its meal. 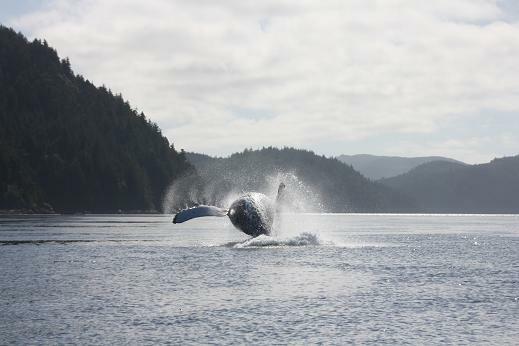 …breaching whales. 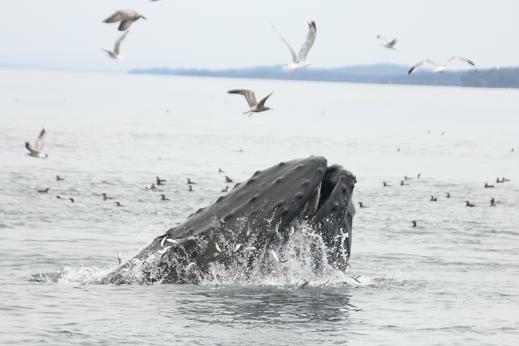 Just because there are more whales breaching does not mean that there are more photos of whales breaching. It is still one of the most difficult pictures to obtain and until they start giving warning of a breach it will remain difficult. The opposite of yesterdays post is a killer whales going some place. 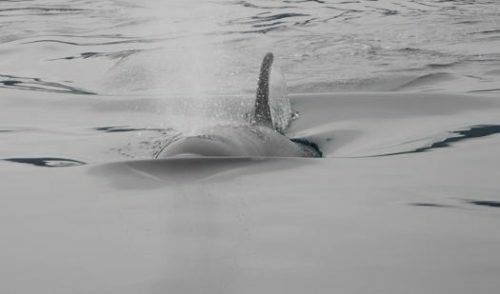 This orca a member of a pod that was passing through Blackfish Sound towards Johnstone Strait (both part of the Inside Passage). 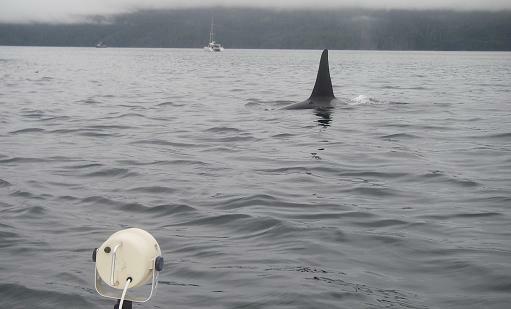 The bow wake tells us that this orca was not wasting time as it came toward and passed beneath our boat. 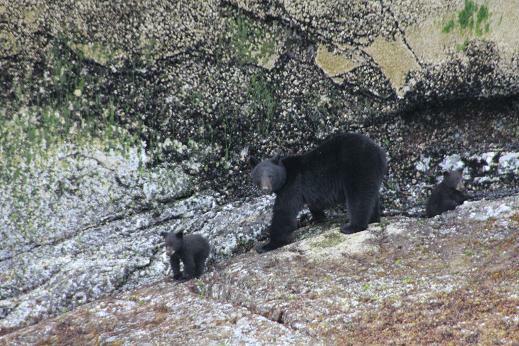 These first year black bear cubs are not able to scrape the barnacles and muscles off the rocks like their mother so they are waiting for a chance to move off the beach to nurse. But then again this photo was from June 18th which makes them two and a half months younger than the grizzly cubs of yesterdays post and at this age that is a long time. 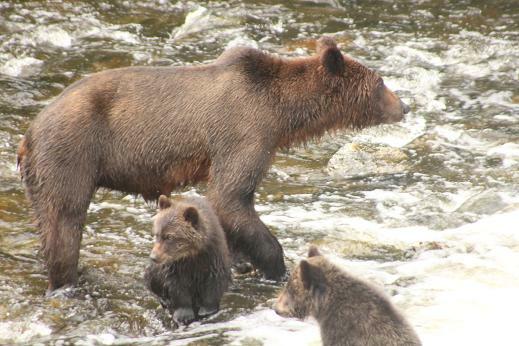 These two first-year grizzly bear cubs spotted on a morning tour try to stay as dry as possible as they wait for mother to catch them another salmon. It is September 6th and the mother is still quite thin as she has to feed her cubs plus put on enough bulk to survive hibernation. Fortunately she has two months to achieve that goal. As usual as the male orca got closer to the front of the boat I moved to the back to allow the guests a better photo opportunity. After all I have seen orca before but the photo’s I have to post are less than dramatic but then I guess you will have to book your dates and bring your camera. Yes it is normal to have killer whales / orca travel in pods that are a complex matriarchal society. Sons and daughters stay with their mother throughout their lives, even after they have offspring of their own. However this does not mean that the larger and older males are always in close proximity they often travel separate but parallel to the family group. For photos it is good to find a large male as they are slower to come out of the water and when the tip of their large dorsal fin shows you have time for a photo. This photo leads to tomorrow’s post…. Peder and Ann again capture the activity on one of their days from their visit in July, 2015. For me as a guide and I know from the guest comments this is one of the highlights of a day on the water – a group of Pacific White-sided Dolphins. 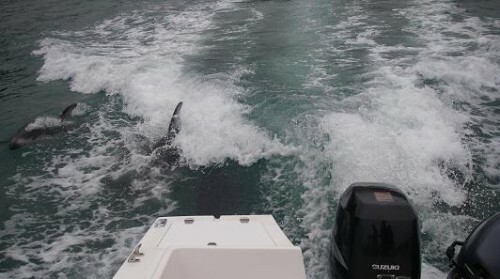 Such a clear and sharp photo emphasizes the speed of these dolphins as they keep pace with our boat. The Marine Mammal Watching Guidelines say we are to stay one hundred meters from the dolphins but unfortunately or fortunately depending on your point of view the dolphins cannot read. 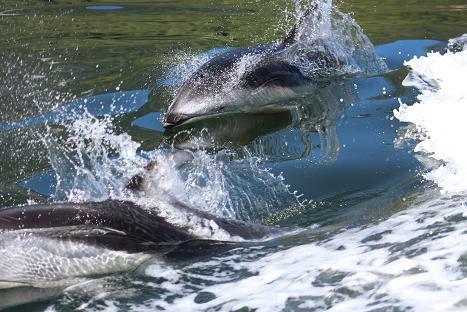 I have tried over the years to parallel a pod of dolphins but they have their own idea of fun. Their plan is to either ride our bow wave of stick their nose right into the prop wash of the motor. 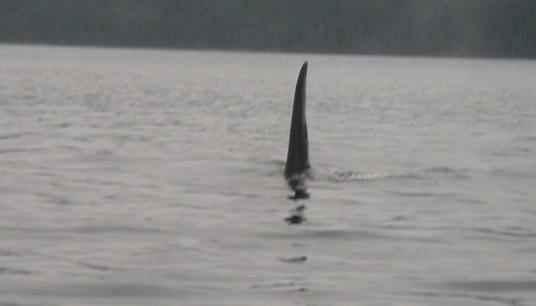 The blackness in the water to the right of the dorsal fin is a third dolphin coming in for a check on our prop. I have developed my own idea (no scientific proof) why dolphins like the prop wash and it is the same reason why people like the water jets in a hot tub – they feel good.